Even as the fight against 25 per cent hike in power tariff by Delhi Electricity Regulatory Commission (DERC) implemented just three months ago is yet to settle down, the commission has drafted another Multi Year Tariff (MYT) regulation for the period of 2012-2015, which might lead to further increase in the power rates. Strategically situated in the buzzing market of Sarojini Nagar, the state-of-the-art South Square has become city's first automated multi-level parking. Over two years after a law student applied for a passport, he got one but not without the intervention of the Delhi High Court which asked the authorities to pay Rs 15,000 as compensation for the delay. The director of a dance academy and two media executives were yesterday arrested for allegedly committing a house robbery in Hari Nagar on October 5, the eve of Dussehra. A 65-year-old man has been arrested for allegedly conspiring with a property dealer to usurp a plot of which he was the watchman for the past 25 years, the police said today. After three years of ground work to record high quality digital images of over ground and under ground utilities like telephone lines, power cables, water and sewer lines and roads, the Delhi government has decided to launch a portal that will have images of all the public utilities. A man, who agreed to pay Rs 1 crore to his estranged wife to settle a matrimonial dispute, has been asked by the Delhi High Court to pay an additional Rs 1 lakh to a school for the visually impaired after it acceded his request to stop a trial on his wife's complaint. Three people were arrested yesterday for allegedly killing a BPO employee by using a wooden baton after robbing him, at Palam on October 13. Two robbers were arrested for carjacking an army officer's Scorpio vehicle from his driver at gunpoint in Dwarka yesterday. The headman of Makoda village in Greater Noida, Pradhan Rajkumar Bhatti, has been arrested for allegedly demanding protection money from the owner of a restaurant in Gama Shopping Complex in the Kasna area. The DERC had invited objections and comments from the stakeholders, resident welfare associations and other individuals on the draft by November 8. The commission has also announced public hearing on the draft on November 14. Meanwhile, the RWAs term the calling of objections eyewash as all their earlier suggestions have been ignored. Hundreds of RWAs in Delhi have filed their objections against further increasing power tariff under the MYT regulation 2012 to 2015. "The DERC has been issuing advertisements demanding public objections and suggestions against tariff hike every year. Despite objections along with solid documentary proof and genuine suggestions submitted by RWAs to DERC, the commission has not resorted to a fair decision," said an agitated Rajiv Kakria of GK I RWA. "Most of the objections filed by RWAs remain unanswered by the DERC and the power companies. During public hearings on objections, the RWA representatives are called in small numbers from different parts. They should be invited in a single public hearing in a big hall so that their concerns can be heard together," said Anil Bajpai of the RWA Federation East. Kamal Nath, minister of urban development inaugurated the facility in the presence of Chief Minister, Delhi, Sheila Dikshit while Ajay Maken, minister of youth affairs and sports was the guest of honour. A government and industry partnership, South Square is designed, financed and constructed at an estimated cost of Rs 80 crore by DLF. South Square is spread across eight floors with a parking capacity for 824 vehicles at a cost of Rs 10 per hour. Now all you do is buy a car park card, drive into the facility and leave your car at the basement. The mechanical system then takes over and parks the car. Seven levels from 2nd floor to 8th floor are meant for parking. The ground and 1st floor of South Square offer shopping with over 100 retail shops and restaurants. The retail space will also house kiosks that can be converted into exciting flea market spaces or festive fairs that sell candles at Christmas and diyas at Divali. 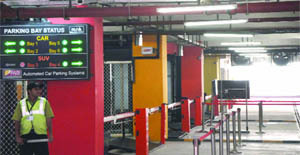 The automated parking lots have car lifts, pallets and computerized control systems that would be operational round the clock. Once on the parking floor, the car pallet is positioned by the computerized system for optimal utilization of space. The pallets move forward, backward, left and right to allow the cars to be moved towards the lift for retrieval. "As the car reaches the parking window, its registration number is scanned and in-time is recorded. The customer drives into the basement and the 'parking bay status' display board indicates the empty parking bay and direction. The customer swipes the card using the instructions on it. The car is transferred to the lift, which moves the car for parking at a slot available on the floors above," explained the NDMC official. "Similarly the car retrieval system is also automated. The customer submits the smart card and pays charges at the car retrieval room and collects receipt from the counter. The customer is able to check through information display unit the status of the request and the lift number retrieving the car. Retrieval on average takes three minutes. The customer moves to the respective lift and drives the car out of parking," he said. Justice Vipin Sanghi on Tuesday pulled up the passport authorities for being insensitive towards people and slapped the fine on them as they handed over the passport to Shantanu Chaturvedi. The petitioner has been harassed for no fault of his and needs to be compensated, the court said, awarding the relief. The 21-year-old Gujarat National Law Institute student, whose family is based in Gurgaon, had applied for passport in 2009 as he wanted to attend moot court sessions abroad. But he did not hear from the passport authorities for over a year. When he checked his passport application's status online, it showed that the officer at the passport office needed to be contacted as there were some issues related to verification. Shantanu got a shock later when he was asked by the passport office to pay a fine of Rs 500 for mentioning a wrong address. His visits to the passport office continued for two years with authorities pointing several lacunae in the application. One day, the officials told him that his application's file was not traceable. So, Shantanu filed a passport application under the Tatkal scheme. The accused have been identified as Shenawaz (23), Chetna Singh (24) and Jaspreet Kaur (24). While Shenawaz runs a dance institute, Royal Dance Academy, in Faridabad, Chetna is a marketing executive of a leading newspaper in Maharashtra. Jaspreet is also a marketing executive with a media firm. The complainant, Alka Panchal, had reported to the police that while she and her children were watching television in her first floor house around 8.35 pm, two men forcibly entered. At knife-point, they robbed the family of Rs 2,50,000, two gold earrings, a cheque book, an ATM card, a wristwatch and some bank documents. A case was registered at the Hari Nagar police station on October 5. The police learnt that Alka had planned to purchase a house around the time of the robbery, but the deal could not be finalised. The cops also learnt that a beauty parlour is situated at the ground floor of the building. The robbers had gained access to the house from the rear gate and Alka told the police that the rear gate remained closed and could not be opened without the involvement of an insider. When the employees of the parlour were interrogated, they disclosed that at the time of the incident, two women were present at the parlour. One, who claimed to be a journalist, was an old customer. The employees said that the women's behaviour had aroused suspicion. The police learnt that the names of the women were Chetna and Jaspreet. They worked as marketing executives with leading newspapers in Maharashtra and Uttar Pradesh, respectively. "The women, who boasted of being journalists with leading newspapers, were acquainted with criminals. We collected their mobile numbers and analysed them. They and three other persons were present in the house during the incident. Also, the numbers were found to have been taken on fake identities. After committing the crime, they had escaped to Gurgaon," said V Renganathan, additional commissioner of police, west district. Shenawaz lived in a rented accommodation in Hari Nagar. The police raided his dance academy at Faridabad, but could not arrest him as he had fled. He was later arrested from Hari Nagar around 2 pm while going to Meerut with his uncle. Jaspreet and Chetna were arrested from Nihal Vihar while trying to flee to Meerut. Shenawaz disclosed that he had been having an affair with Chetna for the past two years. "Chetna used to visit the beauty parlour and was familiar with the owner. After interactions with employees of the parlour, she became aware that Alka's house deal had fallen flat and the cash was lying at home. Chetna had allegedly asked Shenawaz to rob Alka's house. Shenawaz had called two friends from Rampur and conspired with Chetna and Jaspreet. On October 5, Jaspreet and Chetna went inside the parlour and opened the rear gate of the house from inside. After Shenawaz and his accomplices entered the house, the two women slipped into the parlour," said the DCP. Jamuna Prasad, a contractor and Bharat Singh (42), a graduate who suffered loss in business, has been apprehended for allegedly attempting to grab 500 sq yards in Pankha Road by using forged documents. The arrests came following a complaint filed by a civil engineer residing in Janakpuri on November 1, Ashok Chand, deputy commissioner of police (Crime), said. The plot is owned by the mother of the complainant. "Prasad works as a construction contractor. He was provided shelter in Delhi by the engineer's father Dalpat. He was also working as the watchman of the property for the past more than 25 years. He colluded with Singh to forge ownership documents of the property as he was promised a hefty amount," Chand said. Singh had some fish ponds but suffered heavy loss in that business and switched over to property dealing. It all started on November 1 with the engineer and his family receiving threatening phone calls over the ownership of the property. After identifying the caller as Singh, the police approached him. "Singh told us that he had purchased the plot from Prasad in July 2010 for Rs 25 lakh and produced notarised general power of attorney, agreement to sell, affidavit, receipt of cash, deed of will and possession letter. The project is known as 3D images. This will help to facilitate better urban planning and governance. It was an ambitious project of the IT department of the Delhi government, an official of the department concerned said. With the launch of the portal, Delhi will be a member of the elite group of cities like New York, London and Paris where such kind of three dimensional mapping of underground and over ground utilities are available, he said. At present, there is multiplicity of authorities in the city. With the launch of the portal, all the agencies rendering services of public utility have been brought under the ambit of the project which is expected to cut red tap in getting approval for various infrastructure projects. The common database would be made available to various government departments for design, planning, execution and monitoring of all infrastructure projects. On the plea of a resident of Chittranjan Park to stop his trial on the ground that he has already settled his dispute with his wife who does not want to pursue her complaint, Justice Suresh Kait quashed the First Information Report (FIR) lodged by her in 2006, accusing her husband of harassing and mistreating her. The court, however, also ordered him to pay Rs 1 lakh to the principal of a north Delhi-based Senior Secondary School for Blind Boys here within two weeks. "In the interest of justice, I deem it appropriate to impose a cost of Rs 1 lakh upon the petitioner," he said. Justice Kait ordered the man to pay the money to the school for visually impaired on public prosecutor's submission for imposition of cost on the ground that precious government resources and court's time have been consumed in the case since registration of the FIR in 2006. The public prosecutor said after the FIR was lodged by the wife, the police had already filed a chargesheet in the case and the court was to begin soon his formal trial after framing of charges against the petitioner and his family members. In April this year, both the husband and wife had signed an agreement in which the man had agreed to pay Rs 1 crore to his estranged wife to settle all issues. The accused are Ram Singh, alias Ramu (22), Manoj Kumar (31) and Yogender, also known as Yogi (31). Ram is a native of Uttar Pradesh, while Solanki and Joginder are residents of Palam Gaon. 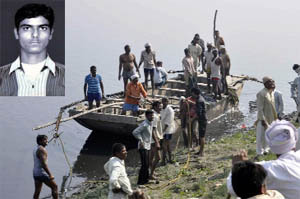 A police official said, "Saurav Gupta was murdered on October 13. He was beaten with a wooden baton. The motive behind the murder was robbery, as his mobile phone and purse were missing. We have seized both the items and Saurav's election card from the accused," said the official. Saurav's father Ved Prakash (54) reported to the police that his son had been working in a call centre, Navigant, for 15-20 days. Saurav would leave his house around 2 pm and return around 1.30 am in an officecab. On October 13, he did not return . The police said around 6.30 am, a passerby informed Ved that his son was lying on a pavement near Dada Dev Mandir. Saurav spoke to his father over the passerby's mobile phone. He told his father that he was beaten up by three people. Ved, his wife and younger son rushed to the spot and took Saurav to Safdarjung Hospital. Saurav succumbed to his injuries at the hospital. He was wounded on his arms, knees, legs, shoulder and head. Investigations revealed that Yogender used to consume alcohol with his friends at the place of the incident. The police said Yogender and his associates had a quarrel with Saurav before he was beaten. The police launched a manhunt to nab Yogender and his associates. On November 9, the police arrested Yogender from his house. During the interrogation, Yogender said he was a driver of a blueline bus and Ram was the conductor. Since the blueline buses were phased out, they both became unemployed. Manoj is a driver in the Delhi Transport Corporation.The police said they were drinking at the Dada Dev Mela cremation ground on Oct 13. They were in need of more liquor. 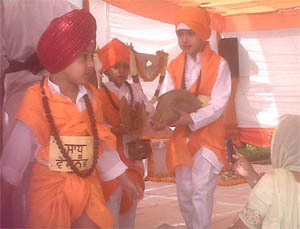 When they saw Saurav arriving they caught him and asked him to give his belongings. To conceal their identities they decided to kill him. They picked up a wooden baton lying on the ground and hit Saurav on his head. Saurav fell down unconscious; the assailants thought that he had died. The accused are identified as Suraj, alias Nanha, and Mahesh. The vehicle belonged to Captain Krishan Kumar. On November 9, Kumar reported that four people robbed his car from driver Satish at Sector 11, DDA park in Dwarka. The driver was dumped near Kharkhoda bypass in Haryana. Kumar revealed to the police that his vehicle was equipped with GPS. The car was tracked via the GPS and found in Sonepat, Haryana. The vehicle and the two carjackers were nabbed near the ICICI Bank at Sonepat. "During the interrogation, the accused revealed that they targeted SUVs at isolated places in NCR and nearby states. They further disclosed the names of their accomplices, Sandeep and Sonu, alias Rajkumar, who are absconding," said Anil Kumar Ojha, Deputy Commissioner of Police, South West district. On Wednesday evening, Bhatti, along with a companion Pankaj, reached restaurant Yellow Chili and demanded Rs 20,000 as protection money. When the owner of the restaurant, Surabh Goyel, refused to pay up, Bhatti and Pankaj allegedly thrashed him and his manager Manoj Kumar. The two were later overpowered by the workers of the eatery. The police then arrested them.